Today, nearly every datacenter has become heavily virtualized. In fact, according to Gartner as many as 75% of X86 server workloads are already virtualized in the enterprise datacenter. Yet even with the growth rate of virtual machines outpacing the rate of physical servers, industry wide, most virtual environments continue to be protected by backup systems designed for physical servers, not the virtual infrastructure they are used on. Even still, data protection products that are virtualization-focused may deliver additional support for virtual processes, but there are pitfalls in selecting the right approach. 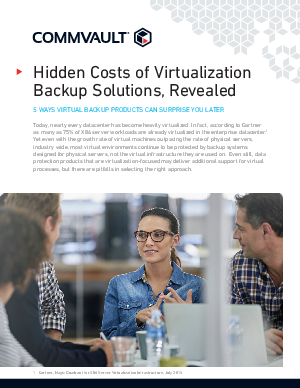 This paper will discuss five common costs that can remain hidden until after a virtualization backup system has been fully deployed.